Two veteran salesman dissect a sales pitch to a particular client, through their young protege. BEFORE: There’s no real motivation for picking this film besides the fact that it stars both Kevin Spacey and Danny DeVito. This will be the second-shortest film of this marathon clocking in at 90 minutes, just four minutes over The Iron Giant. 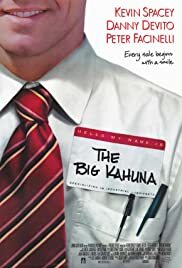 AFTER: The Big Kahuna asks a lot of the big questions like what is the meaning of life and death, is there a God, and discussions about friendship. It asks but it doesn’t really answer any of them. And I can understand that; the writer doesn’t want to presume that he/she has the answers to everything. Damon Lindelof, writer on Lost and Prometheus, has stated just that in response to criticism about Prometheus which asks a lot of similar questions. What I don’t like about The Big Kahuna though is the whole film is about these questions. It’s not until the last ten minutes or so that you get some sort of conclusion or wrap up. Phil (Danny DeVito) gives a big speech on what he believes to be the answers to many of the questions, but it’s too little, too late to make up for 80 minutes of discussions that go nowhere. Danny DeVito is really the star of this film. Kevin Spacey and Peter Facinelli both give adequate performances but it’s DeVito who convinces you of his beliefs. The very subtle facial expressions and the look in his eyes as he gives the big speech at the end of the film, sells his character as someone who has been through a lot and has the right to speak about matters such as these. Before Phil gives his speech at the end, there was nothing entertaining about this film. It’s a slow-moving, theological, question machine. But Phil’s words at the end gives the film meaning and gives the viewer an opinion about life’s biggest questions to think about and that’s why I give this a rating of two as opposed to a one.